Above: A Dixon Studio Tour visitor relaxes at painter Eli Levin&apos;s stop. Photography by Inga Hendrickson. CLEAN UP THE yard. Put away garden tools. Rake up the bones and kindling that the puppy scattered around the lawn. Deal with potential tripping hazards. Scrape up leaves along the lane with the tractor to make for easier parking. Then clean up and wipe down and vacuum the house and greenhouse, make sure there’s toilet paper in the bathroom, and check whether we have enough paper plates and plastic cups and napkins and cider. And on and on. You can argue that the main value of participating in an artists’ studio tour, in this case the Dixon Studio Tour, is to clean up your place to get ready for winter. The arrival of important houseguests can have the same effect. But after 30-some years at it, the late October/early November routine is firmly engraved in my psyche, to the point I hardly need to make lists anymore. Essentially you prepare to be invaded by hundreds of art-loving visitors over the two-day weekend, including many old friends from all over northern New Mexico and long-standing customers from Santa Fe, Taos, and Los Alamos, plus neighbors from the Embudo Valley. This year’s tour takes place November 4–5, with 28 studios. Besides our garlic farm, other stops include two wineries, one brewery, the Rift Gallery, Rinconada Art Garage, ManifeStation Arts, Métíer Weaving, and other businesses and community gathering places. Partici-pants represent every medium, including collage artist Alice Arango and jeweler Johnny Hernandez, both new to the event this year. In one weekend, you can meet everyone who lives in the Embudo Valley. Some come by our place just to say hi, some to buy a handful of garlic or shallots, some to stock up on them for the winter, others to buy my books, and probably a few wondering why they bothered with our art-free stop. In past years, they also came to sample my wife, RoseMary’s famous chocolate zucchini bread, 40 loaves of which she used to bake, and her peanut butter cookies, plus locally pressed cider. For all the work it takes, both before and during the event, those two days of the tour have also brought me important new friends. The studio tour is a celebration of what we artists, craftspeople, and farmers can do with our land and hands and imaginations, given this gift of a special place, a special community, at a time of the year when the weather—gloriously sunny or swept with rain or snow—portends the approach of the deep hibernations of winter and the quiet renewal of earth and spirit. 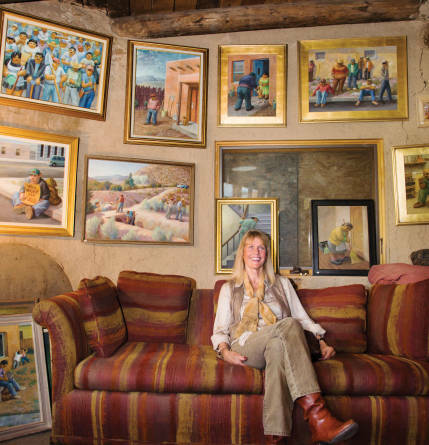 With so many artists calling New Mexico home, it’s no surprise that these studio tours occur throughout the state, mostly during the warmer months. It’s worth piling some friends into a car and heading out. In towns large and small, you’ll find a generous welcome, along with art. You might say that I’m in my waning days of the Dixon Studio Tour. Our peak was the mid-nineties, when we sold garlic arrangements made by RoseMary and various friends who worked for us, plus wreaths from flowers we dried in silica sand, gourd pots and bird feeders that I carved and stained at night in the greenhouse, strings of decorative gourds, and, of course, winter squash and pumpkins and garlic and shallots and onions. Surrounded by our cornucopia of goods, most visitors were compelled to walk away with something. The crowds were so thick that we staffed the place with two or three of us outside: one of us directing traffic and two inside the house serving cider and sweets and selling our goods. Of course, not all guests shared her enthusiasm. On one occasion, a particularly warm afternoon, as a well-dressed mother and daughter passed by the open kitchen window on their way out, I heard the mother say, somewhat scornfully, “I guess that’s what you would call a country kitchen.” On another occasion, the two rooms crowded with tour-goers, a woman came up to my wife, RoseMary—take note of her name, RoseMary Crawford—and proclaimed, “Mrs. Crawford said I could use the phone.” We never discovered who the mysterious other Mrs. Crawford was. I’m still on the tour, although these days I have a slightly smaller selection: garlic arrangements, loose garlic and shallots, and my books, both old and new. Last year, we didn’t have our usual bounty of winter squash, so we confined the display area to our attached solar greenhouse, a 14-by-36-foot space, leaving the rest of the house as an occasional refuge from the madding crowd. So far as I can tell, the only problem with being on the tour as a participant is that you can’t experience the whole event—creative neighbors putting out their best work, a peek into other people’s private lives, and a chance to renew old friendships. From 1998 to 2001, while I worked on the planning phase of the Santa Fe Farmers’ Market site in the Railyard, we were not on the tour, so RoseMary and I were able to play tourists in our own village. We mingled with the crowds, poked around friends’ studios and kitchens and living rooms like everyone else, appreciated the rich diversity of arts and crafts and food items, even bought the odd trinket. And it was amazing to see “downtown” Dixon (pop. 926) so crowded with pedestrians that traffic had to slow to a crawl. The Dixon Studio Tour, like most of them, is a grand community event. Its planning and organization consumes six months and a dozen volunteer committees—sign making and distribution, map design and printing and mailing and distribution, finances, porta-potty rentals, publicity, and an overall steering committee. At one of the oldest studio tours in New Mexico, you can visit dozens of artists’ homes, studios, and galleries, November 4–5, 9 a.m.–5 p.m. For maps and a list of participants, go to dixonarts.org. Studio tours are a great way to explore a community and get to know the people who live there. Artists let you see how they work and live—and that gives the artwork you buy special meaning. Volunteers do their best to keep info up to date, but times, routes, and other details can change. Most have yet to set their 2018 dates. Check the websites below before you head out.